We all know that summer in the south of France is to be envied. Long hot summer days, often with a cooling breeze that makes the searing days more bearable. But, an often forgotten season is autumn and my favourite time in the south of France. The heat mellows to a pleasant warmth, and the summer masses depart. We are left to enjoy the festivals often celebrating the countryside’s autumn bounty. From chestnuts to mushrooms and of course the first of the new wine from this year’s harvest. The Haut Languedoc is an area just twenty minutes north of us. Here vineyards make way for forests and mountains and where everything is just that little bit greener. From the beginning of October onwards you will see cars parked in lay-bys as locals fill their bags with chestnuts and the even more coveted cèpes or wild mushrooms. The mushroom hunting grounds are a closely guarded secret. Unless you one of the lucky ones in the know you will have to settle for buying a bag full at the local market. 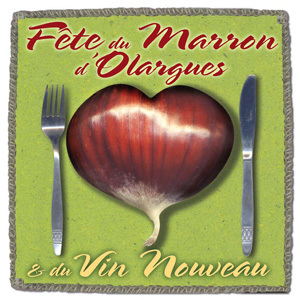 One of my favourite festivals takes place in Orlargues. Here the little streets of this charming village play host to various market stalls with local produce for sale, and you are greeted with the wonderful aroma of roasted chestnuts which you can enjoy with a glass of new wine. If you feel like something else to nibble make your way to one of the numerous stalls where anything with chestnuts is the order of the day. As autumn slowly makes way for winter, we know we will soon be able to slowly wend our way from village to village. The local Christmas markets, are a great place to stock up on traditional fare to share with friends and family over the Christmas period.